I was so excited to see this gorgeous card from Joy Taylor for this week's Case Study #95 challenge. 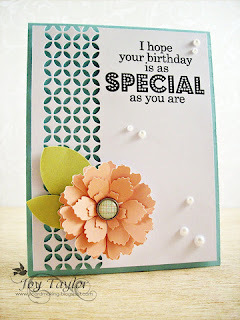 I love Joy's style, and she used one of my very favorite dies on her card. It's been a long time since I played at Case study, but I saw Joy's card and immediately knew what I wanted to do. I used the same die, Piestra Tile, and flower placement. Really, the only thing I changed was to move the sentiment down, which looked better on my card because my sentiment was so small, and I did not use all the pearls, because that is not me. I really loved this card so much, and decided to make a couple more of them. Here they are together. This is the start of a card set that will be a gift for my daughter's Hebrew tutor. She has been patiently working with my daughter to get her ready for her Bat Mitzvah this fall, and has always been so appreciative and interested in the details whenever I give her anything handmade. I think I'll complete the set with Rosie Posie, and stamp some coordinating envelopes as well. Joyce, you did such a wonderful job on this challenge! These cards are gorgeous, and I love how you changed the color of the flowers on each one so they are unique but the same...nice! These are gorgeous, Joyce! I love that die, what a cool effect! These are really beautiful...... your daughter's tutor will surely love them! Oh my gosh Joyce these cards are just fantastic. You really rocked the CASE Study challenge. I need to case this one and get this Memory box die too. These cards are awesome. You knocked the CASE Study out of the ballpark. What a lovely gift for your daughter's teacher. The colors are beautiful. Great job with the cards!! that die is terrific!!! It really makes a great background! You've done an outstanding job on this CASE, Joyce! Doing this as a card gift set for your daughter's tutor is a wonderful idea. She's going to want to keep them and not send them to anyone else! A beautiful set of cards - fab gift. Joyce, great take on the challenge. Looks like a winner to me - not only did you hit me once but BAM! Three times! Really beautiful! All I have to say is this was the final push for me to get this set. GORGEOUS! I now declare you the winner! These are gorgeous and will make such a lovely gift for your daughter's teacher! And between you and Joy I now MUST have that die! LOL! I'm falling in love with that die. Love the colors you used. And I totally agree with the placement of the sentiment. Can't wait to see what you do with Rosie Posie! What a beautiful set, Joyce! I love every one, and that die is just amazing. Thanks for joining us this week at CASE Study! Sooooo pretty!!! I love each and every color!!! WOW! What a fantastic set of cards!!! Congrats to the top three position on CASE STudy!!! congrats on making the top3 at CASE study sweetie! love your card set. Beautiful card set! Love the strip at the side and of course, that gorgeous Piestra tile! Congratulations on being Top 3 at CASE Study! love this card set - great gift idea! Joyce - there are a few scrapbook/stamp stores left in SD county. Paper Tales in Point Loma, Cool Scrapbook Stuff & Stamping Details in Poway and Ever After in Vista (not too far from GeeGee's) are all different & worth the visit. PT updates their blog regularly, CSS & EA update FB more. They are all great! I bet her Hebrew tutor will love them. What a beautiful card set...love that die with those fabulous flowers at the bottom. This is one of the sweetest card sets I have seen and makes a perfect gift for anyone. Wow, love how your switched out flower colors and sentiments--this will be a fantastic gift set! I thought of you the instant I saw the Case Study sample for this week. That Piestra die makes some gorgeous cards--well, not the die but the talented person who has one at her craft table! These are lovely. That tile die is awesome! The pairing with Rosie Posie was a good one. This set is beautiful Joyce! I bought that pestra die yesterday because of you:) Hope you're having a great weekend! I love these better than the actual case study card. SHH!! Don't tell anyone. These are beautiful with the pretty peonies. I'm pinning them to case YOU! !